I haven’t taken my own children here, but as a youngster I once visited a very interesting place called Teufelshöhle with my family. Teufelshöhle, literally translated as Devil’s Cave, is an enormous dripstone cave located near Pottenstein, Germany. The cave is open to tourists, and is a fantastic natural wonder worth seeing. After descending a distance into the cave, one enters numerous natural chambers, each with its own unique and unusual geological formations. 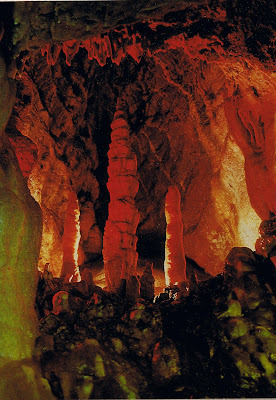 Stalactites (the ones dripping from the ceiling) and stalagmites (the other ones) form bizarre shapes and are thusly named “the Organ,” “the Curtain,” “Pagoda Pillar,” and the multi-colored, beautifully illuminated “Crucifixion.” The two oldest limestone formations – one of them dubbed “Goliath” – are estimated to be one million years old. The deepest location in the Devil’s Cave is 230 feet below the surface of the cavern entrance. In the chamber known as “Bear’s Grotto” there are piles of animal bones and skulls of cave bears from the ice age. It is believed that these cave bears were trapped by sudden cave-ins and starved to death. A 12 foot high, 900 pound bear skeleton has been reconstructed inside the Bear’s Grotto. 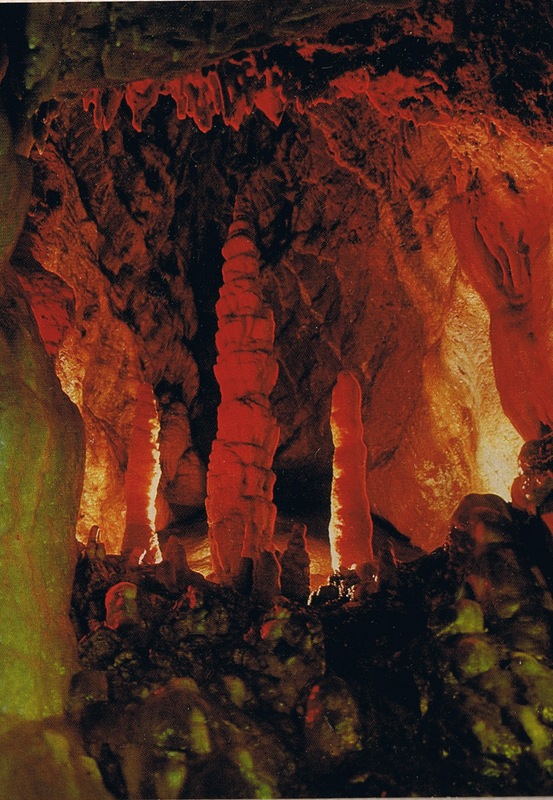 Kind of funny how the Devil’s Cave got its name. Before humans discovered the cave, animals would wander in, get trapped or lost, and never come out. The local people couldn't figure out why their livestock kept disappearing. Their logical explanation was that the Devil must be taking them. Guided tours of Teufelshöhle are available year round in English and last about an hour. Tickets for guests over 16 years are 3.80€, children 4 – 15 are 2.00€, under 4 are free. A family ticket (2 parents and at least 2 kids) is 10.00€. Definitely one for the "must see" list. I'm especially intrigued by "Bear's Grotto" with all its skeletons. Crazy story! Very cool pic!